Former Australian star Joe Roff joins the Conquistadors for Dubai Rugby 7s 2017! A great article from The National newspaper in the UAE today. Click here. Awesome to have this bloke, Joe Roff, Rugby World Cup winner with the Australian Wallabies, and a former Oxford University rugby team mate, helping out with our charity team, the Mike Ballard Foundation Conquistadors, at the Dubai 7s when he is not on official duties with HSBC. Mike Ballard, the Conquistadors Manager, is also rather excited for the Sevens. We are playing in the International Social, with the Timetable for Day 1 below if you want to give us some support! And a massive thank you to all of our sponsors who have supported us and continue to support us! We are incredibly grateful to you! 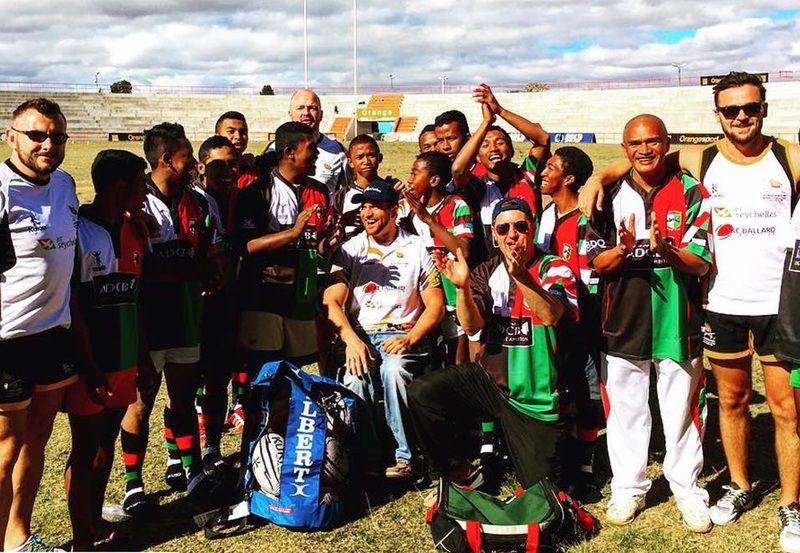 Wheelchairs, rugby and lemurs: The Arabian Gulf rugby community spreads goodwill in Seychelles and Madagascar. It was the morning of 26 June 2016, two day’s prior to the departure of the Air Seychelles Mike Ballard Foundation Conquistadors goodwill rugby mission to Seychelles and Madagascar. The Middle East based team, with players from clubs in the United Arab Emirates, Bahrain and Qatar, awakes to the news that there had been what was described as a terrorist attack at Mahamasina Stadium in Madagascar, killing two and wounding 80 people. 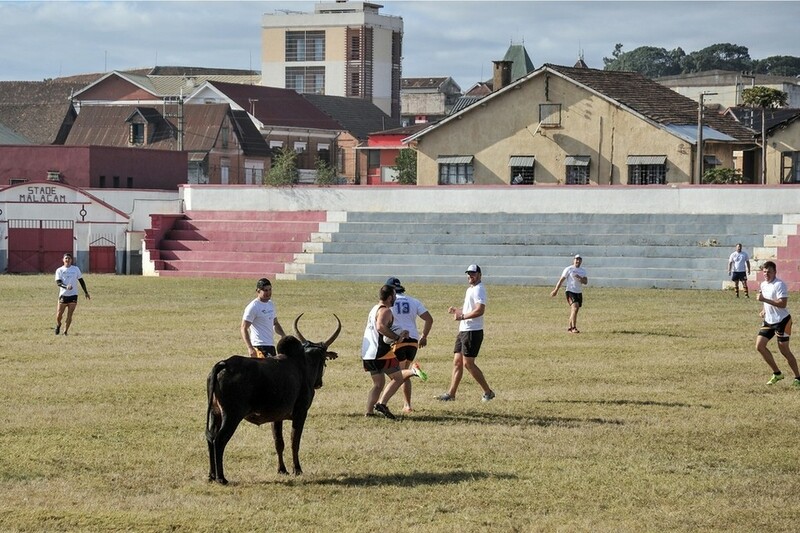 The stadium was the very place where the Conquistadors were intending to play the Madagascar national side in a rugby match one week later. To go or not to go – that was the question. We did a risk assessment – following the attack Madagascar was categorised as a ‘medium travel risk’ – the attack initially considered to be a ‘one-off’ associated with a national day rally. We asked the team – were they prepared to travel to Madagascar given the circumstances? Excited and nervous we headed to Abu Dhabi Airport for the primary sponsor, Air Seychelles, flight to Madagascar via the Seychelles. 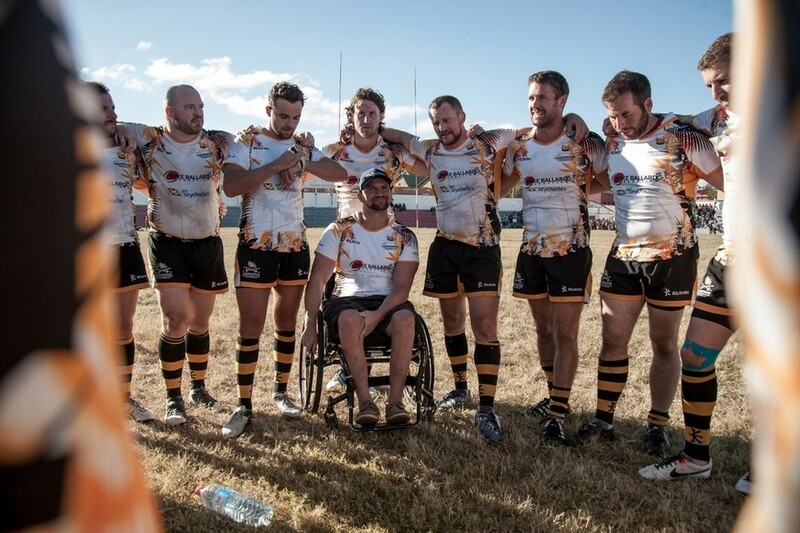 Seven months earlier the team had formed under the banner of their good mate, Mike Ballard, an American national from Michigan who suffered a serious spinal injury whilst playing for the Abu Dhabi Harlequins in the 2014 West Asian Club Championship final. At the time and over the ensuing two years, the Arabian Gulf rugby community supported Mike, who that year was nominated for the prestigious UAE Player of the Year Award. Now back on top his rehabilitation after two determined and inspiring years (he broke every rehabilitation record at the Mary Freebed Rehabilitation Hospital in Michigan), Mike has moved back to Abu Dhabi to live and work, taking up a place at his old school, the “New England Centre for Children with Autism”, where his teaching greatly inspired the Autistic children and their families. The Conquistadors were set up initially to support Mike with his move back to Abu Dhabi – and Mike arrived the night before the Dubai 7s – making it back to lead the Conquistadors onto the pitch at the Dubai 7’s in December 2015. 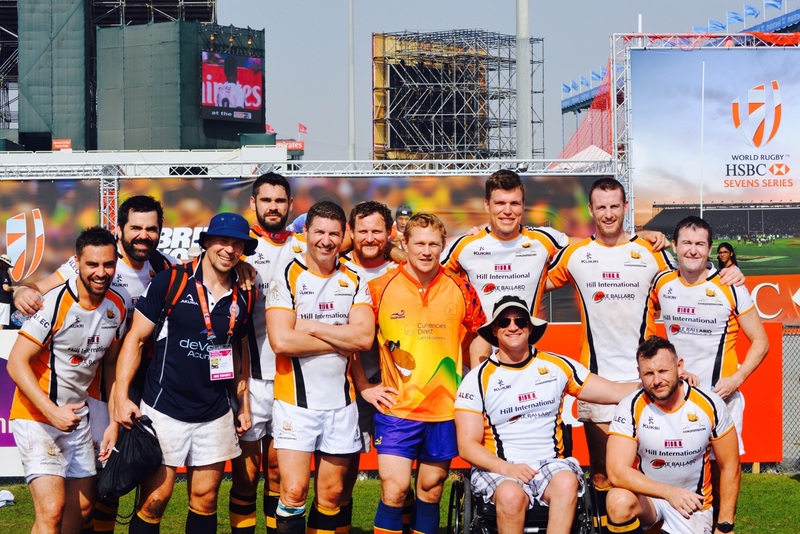 Mike Ballard Foundation Conquistadors and the Lewsey brothers, Ed and Josh, at Dubai 7s 2015. 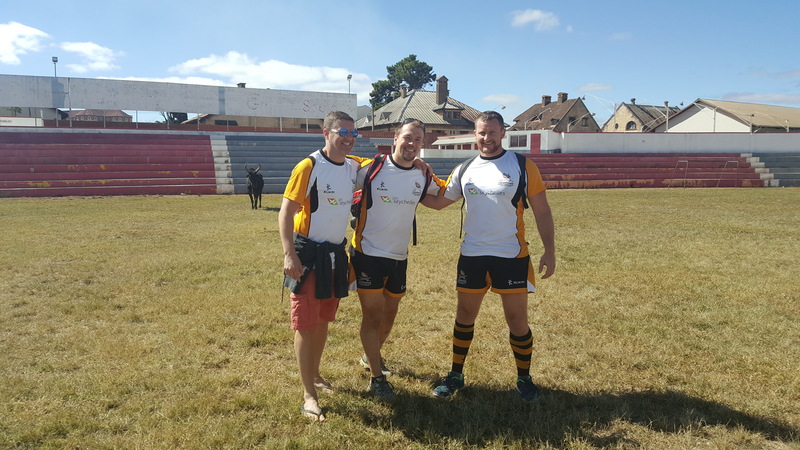 With the success of the team at the Sevens where they reached the semi finals of one of the local leagues, Mike and the team took the initiative to embark on an annual ‘good will’ mission to have a positive impact on the lives of others, through rugby union. And so it was that we were enroute to Seychelles, six months after the Seychelles and Madagascar vision. 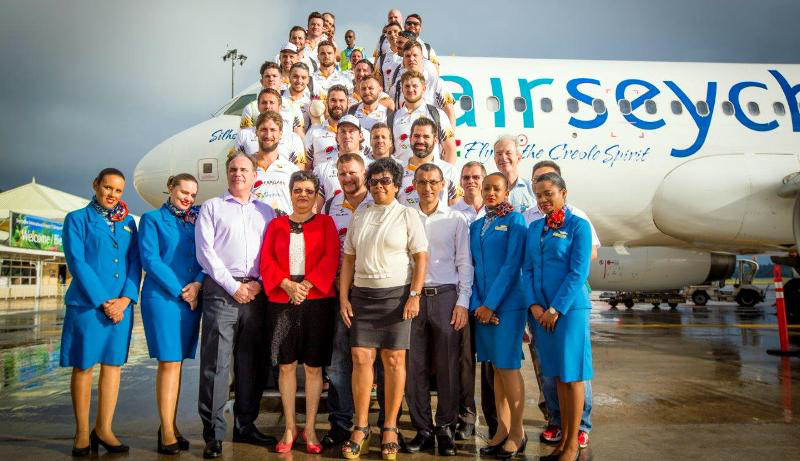 After a very comfortable flight (the management team were grateful to fly business class much to the team’s chargin), we were greeted upon disembarking by no other than the Seychelles Minister of Health, the honourable Mitcy Larue, the CEO of Air Seychelles, Roy Kinnear, members of the Seychelles Rugby Union and others. A fantastic press conference ensued and the team donated 20 wheelchairs to Seychelles hospital. I don’t think any of the gents who were part of the mission team had experienced anything like the conference at Seychelles Airport. “I feel like a rock star,” commented one of the younger members of the team, Charles Etchells, who is studying to be a doctor at Manchester University. The photos sum up the wonderful experience. And then it was onwards to Madagascar where we intended to donate 40 wheelchairs and medical equipment to the Aide Manjakasoa Madagascar rehabilitation facility, hold two day’s of rugby coaching with 300 U14 children from 7 clubs and 3 schools; and play the match v the Madagascar national side. Madagascar. What a place. The third largest island in the world is a developing country where nine out of ten people live on less than two dollars a day. It is also a country where rugby is the national sport with over 48,000 participants, and the national team, ‘the Makis’, are ranked 41 in the world. Put simply, they are rugby mad! 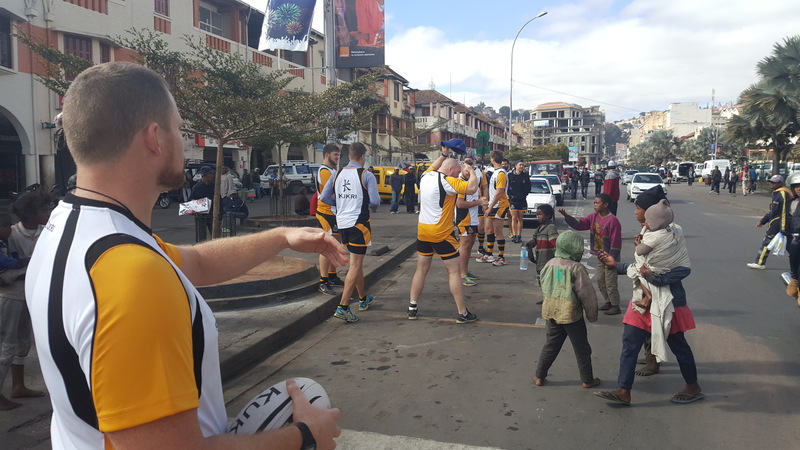 Madagascar has the third highest number of registered players in Africa but the majority of rugby playing children (90%) don’t have any uniforms. 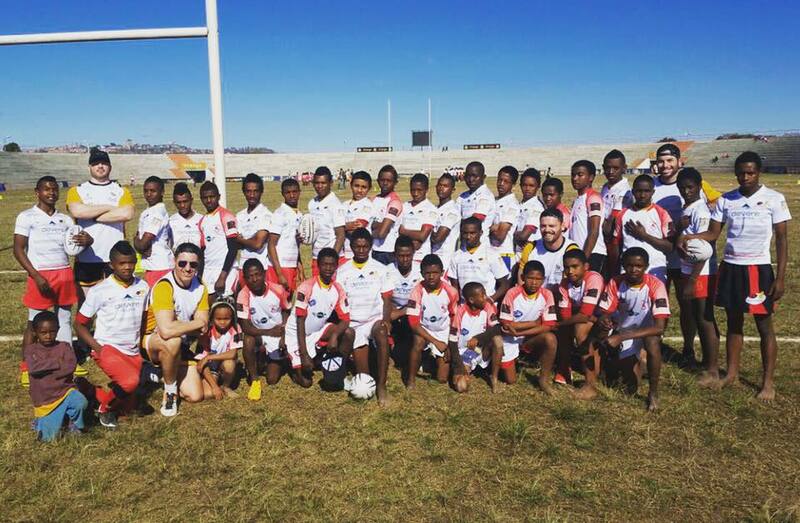 Air Seychelles Mike Ballard Foundation Conquistadors in Antananarivo. Mahamasina Stadium where the attack was, is behind. On the way from the airport to the hotel, the bus went silent. There were thousands of people, all busy, doing something, going somewhere, and they didn’t appear to have much. It was a sobering sight. Despite not appearing to have much, the Madagascan people had a proud dignity about them – were not pushy and had a good sense of humour. When we started unpacking the gear from the bus on a busy street, rather than try and sell us a set of drums and vuvuzela, the vendors began playing for us – which afterwards resulted in a number of vuvuzela’s being purchased. 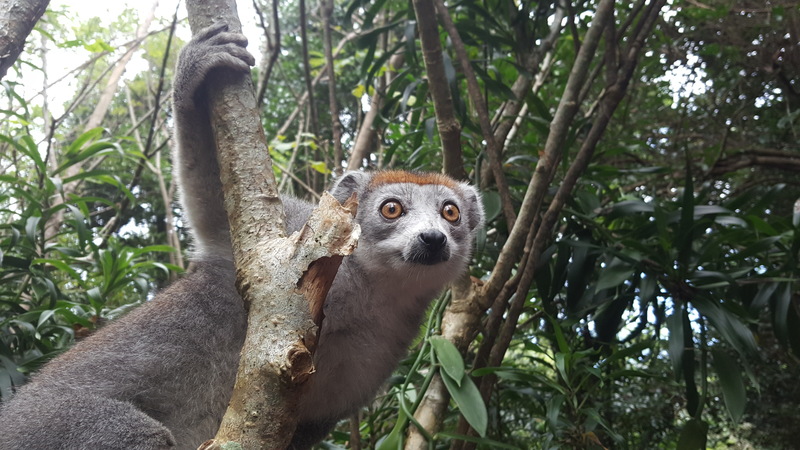 Played an ‘exhibition match’ against the Madagascan Rugby Team, the Makis (the Malagasy name for the ‘ring-tailed lemur’), currently ranked at No.42 in the world. 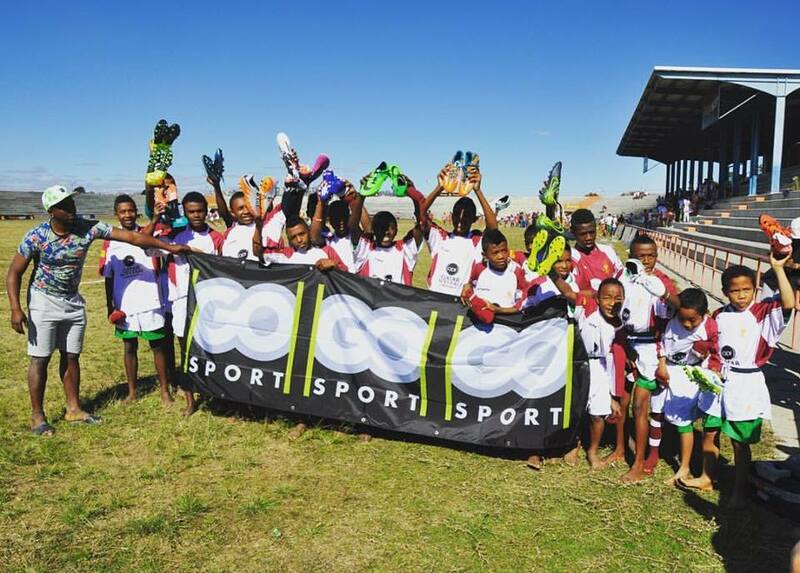 The boots kindly donated by GoSports were a real hit! 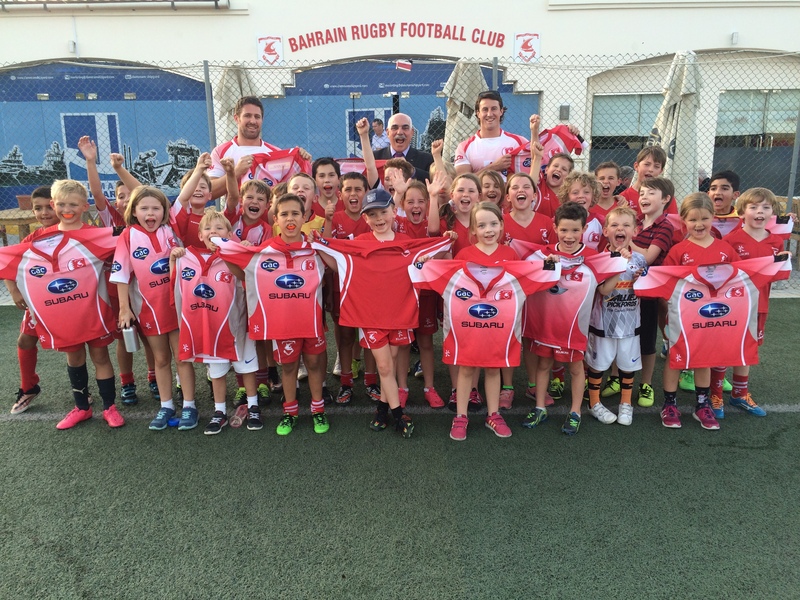 Children here are also wearing kindly donated Doha Rugby Football Club uniforms. Seeing the smiles and gratefulness on the children’s faces when they received new uniforms and boots. 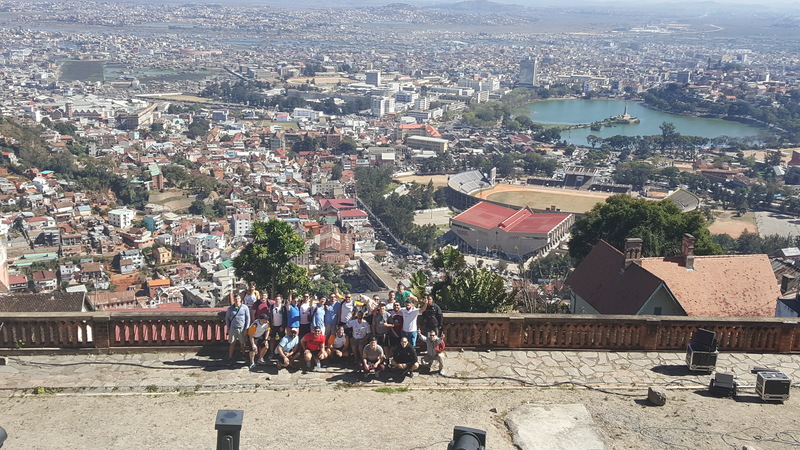 The Dubai Hurricanes shirts kept popping up all over Antananarivo! Both junior girl and boy rugby players had phenomenal skills! 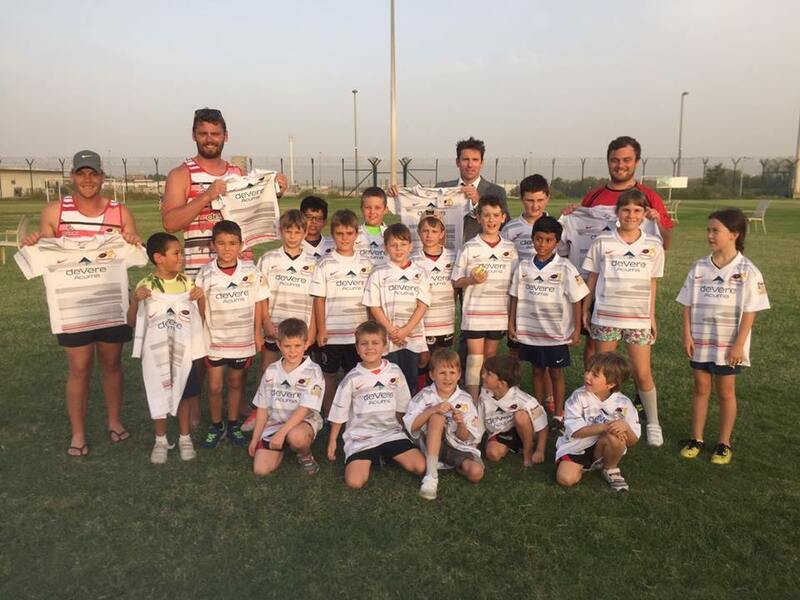 And the result in Madagascar – a full team kitted out in Abu Dhabi Saracens kit! Bahrain RFC Kit was a real hit in Madagascar! The Dubai Hurricanes were incredibly generous, donating the most of any club! 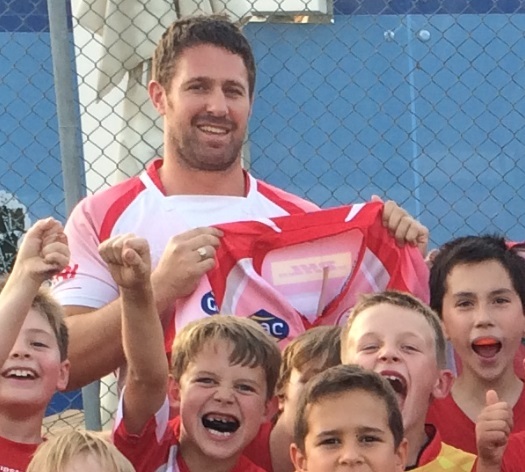 Adam Telford, retiring UAE captain, was a fantastic asset to the mission, the Jebal Ali Dragons kit also very popular! British School of Al Khubairat Director of rugby sought to build a bridge between Antananarivo and Abu Dhabi, sharing penpal letters from Abu Dhabi. 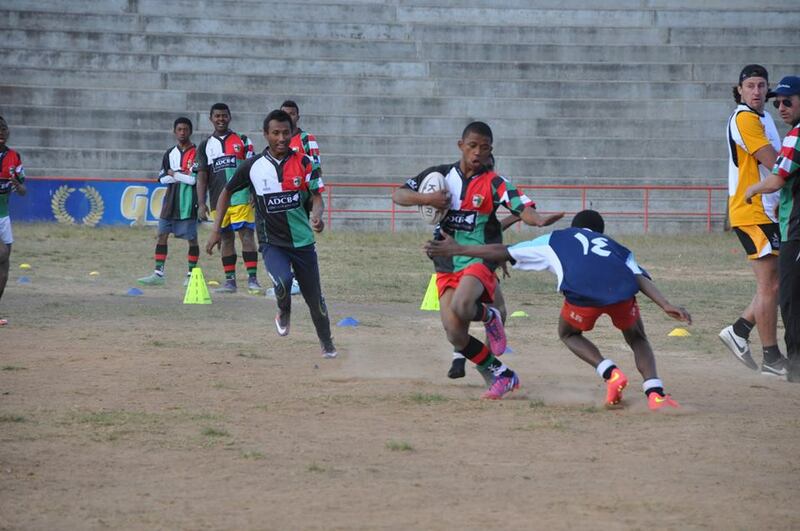 Seeing how good the Madagascan juniors were at rugby – their skills, offloads, and physicality rivalled junior rugby growing up in New Zealand. The Abu Dhabi Harlequins rugby kit was gratefully received. Unwrapping the wheelchairs at the Aide Aide Manjakasoa – logistically getting them there had been a mission in itself. 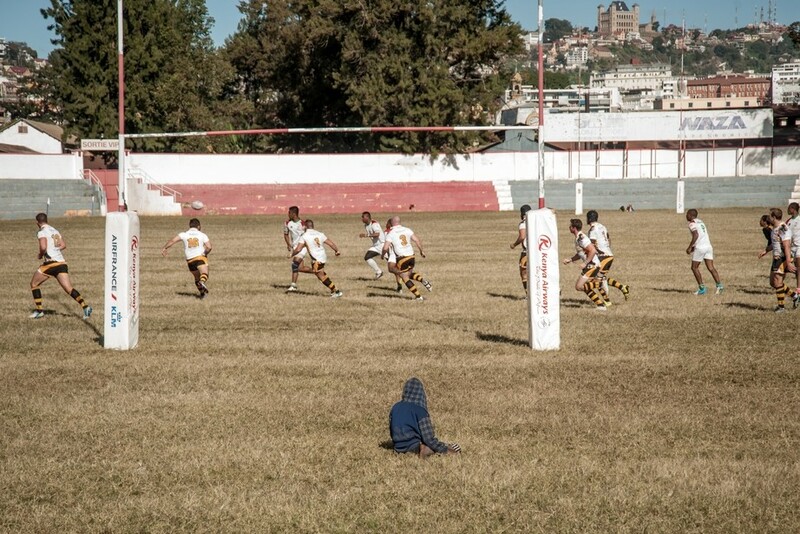 Playing a match against the Madagascan National side, when it looked very unlikely following the terrorist attack. It was wonderful to have seven of the clubs in the Gulf playing together side by side – Abu Dhabi Saracens, Abu Dhabi Harlequins, Bahrain RFC, Doha RFC, Dubai Hurricanes, Dubai Sharks, Jebal Ali Dragons, and British School of Al Khubairat – a throwback to the Arabian Gulf days. We were lucky to play a match at all. Following the attack on the stadium, all public events were banned – understandably. Initially, months earlier, we were informed that the game was to attract over 30,000 people. After the event, however, we were informed that we could play, but with no crowd – it would have been too much of a security risk. We were disappointed of course – we all wanted to play in front of 30,000 people, but in the big picture, the objective of the mission was the charity work – and we still managed to complete that. Finding a stadium also proved to be a mission – with the Mahamasina Stadium out of action, and the ‘Makis Stadium’ hard as a rock and with a number of sizeable holes in it, a ‘SWOT’ team of Tom Calnan, Edward Lewsey and Winston Cowie went on a mission to view other options. 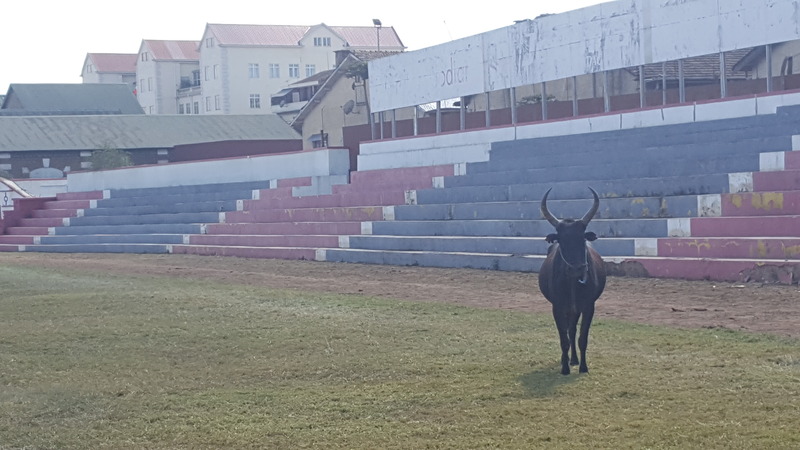 We didn’t have to go far – a 20 minute walk from the Hotel was the Stade Malacan, replete with lush, springy grass, and a resident bull. We managed to find a stadium, with its own hazards! On the match, there were strong performances from centres Stephen Hamilton (Abu Dhabi Saracens), Adam Wallace (Bahrain RFC), half back Ed Lewsey (Abu Dhabi Harlequins), and in the forwards Harry Seward and Graham Murphy (Abu Dhabi Harlequins). Tries were scored by centre Adam Wallace (Bahrain RFC), Winston Cowie (Abu Dhabi Saracens), Ed Lewsey (Abu Dhabi Harlequins), and Harry Seward (Abu Dhabi Harlequins). 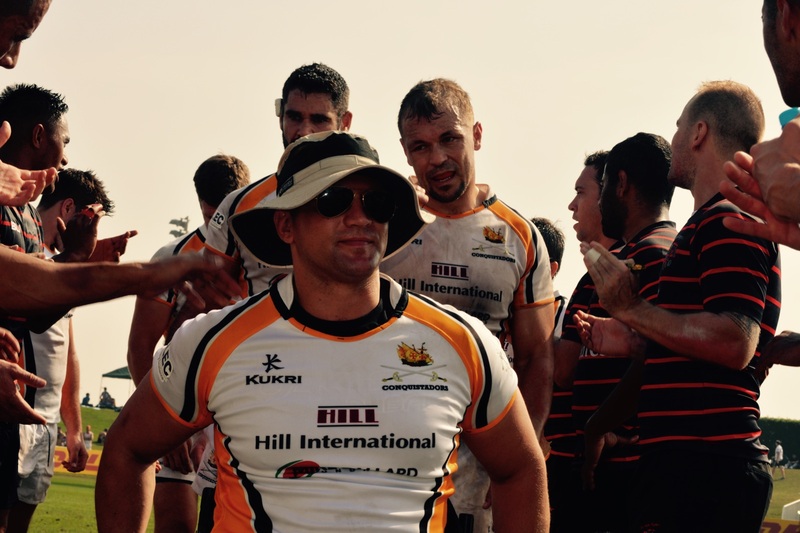 Sam Wilson (Bahrain RFC) was named co-captain for the match with Adam Telford (Jebal Ali Dragons) – both have contributed a huge amount to Arabian Gulf rugby – and both were playing their last big matches. Adam, unfortunately had to fly back to Abu Dhabi as the match was postponed to find a suitable ground – so it was Sam Wilson who captained the side. 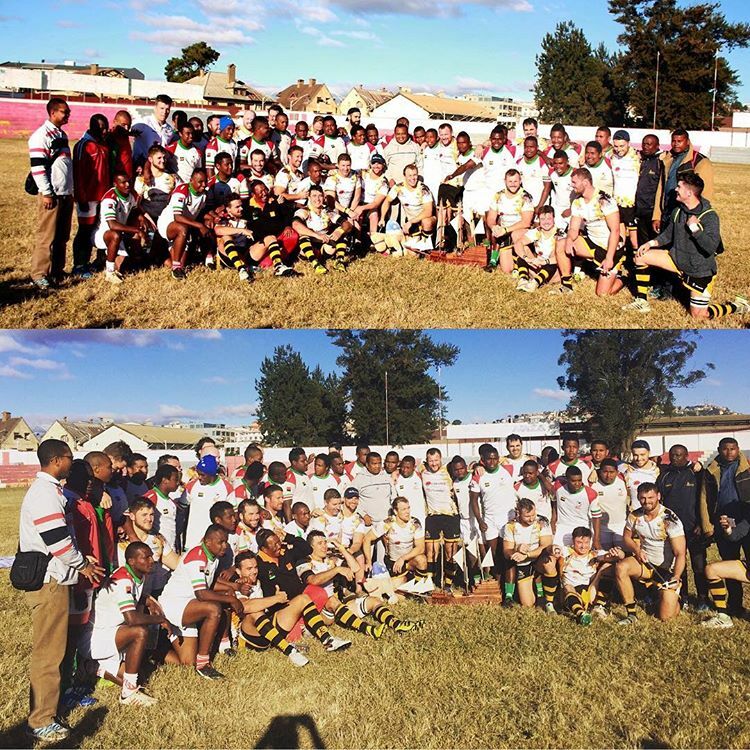 The final score was 55-26 to Madagascar, the Conquistadors winning the second half 26-19. The goodwill mission was expertly covered by experienced journalist, The National newspaper’s Paul Radley. 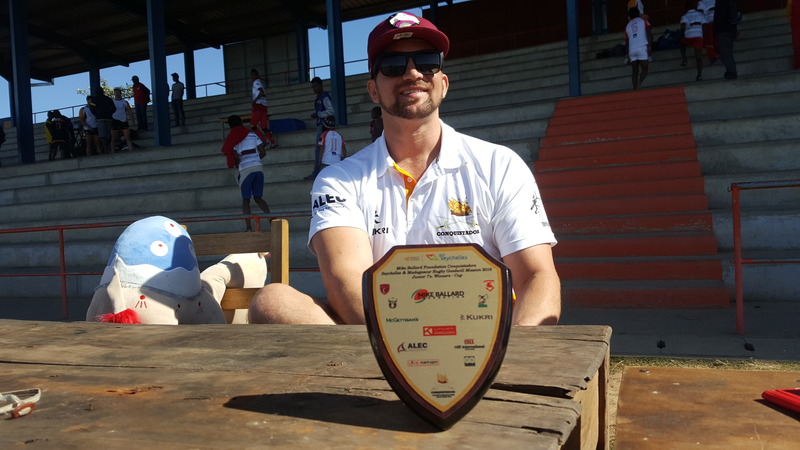 Paul completed the below articles, and the following video which gives a real indication of the Air Seychelles Mike Ballard Foundation Conquistadors Goodwill Mission 2016. Team Dubai Sports City Training Camp Video. Click here. Air Seychelles Mike Ballard Foundation Seychelles and Madagascar Goodwill Mission Video. Click here. 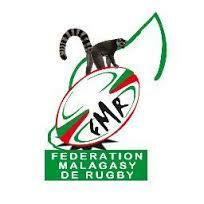 Arabian Gulf rugby players to go ahead with Madagascar goodwill visit despite security concerns. A massive massive thank you to all of the Air Seychelles Mike Ballard Foundation Conquistadors sponsors who made this goodwill mission possible. We simply could not have done it without your kindness and generosity! 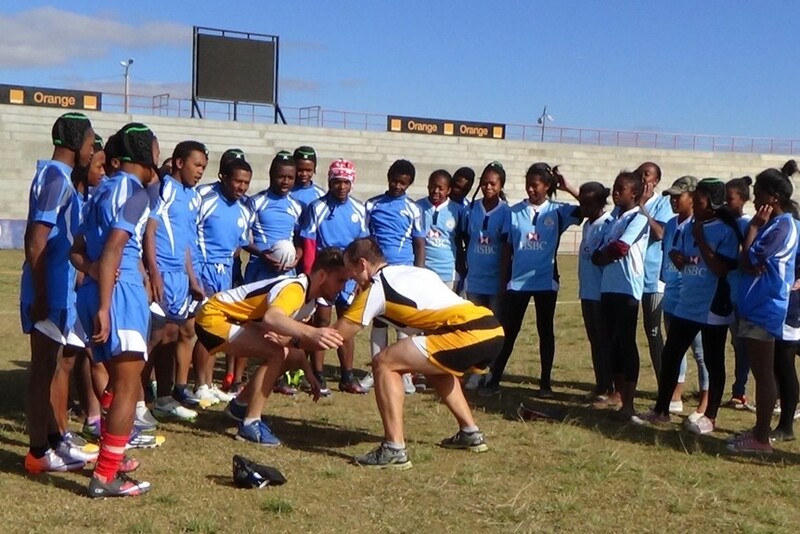 A massive thank you to Malagasy Rugby for hosting us and showing us around Madagascar – what an incredible country! 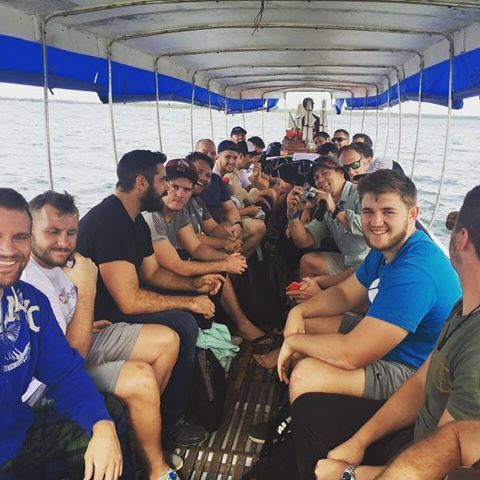 Who could forget our boat trip across a lake full with crocodiles? 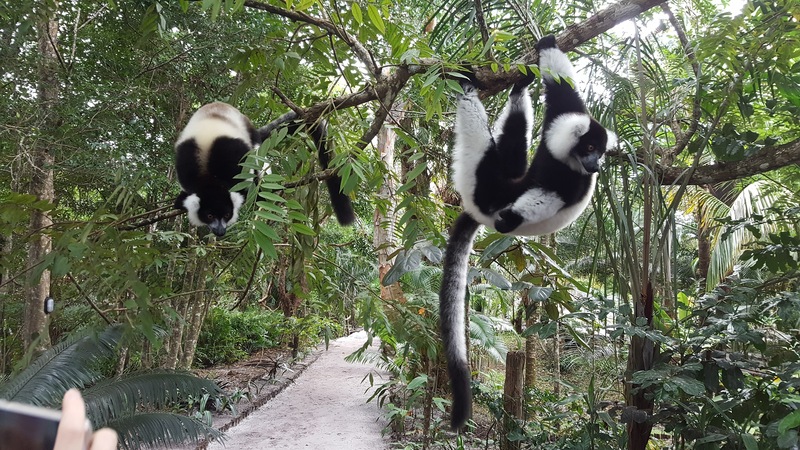 And those lemurs…. Many thanks to all sponsors, Malagasy rugby and the Arabian Gulf rugby community. We all feel incredibly grateful to be a part of such a wonderful rugby community – the Arabian Gulf. Together we have achieved something pretty special. Manager Mike Ballard and coaches Winston Cowie and Ed Lewsey are pleased to announce a very experienced rugby team to travel to Madagascar in July to play the Madagascan national side, the Makis, as part of a goodwill mission. 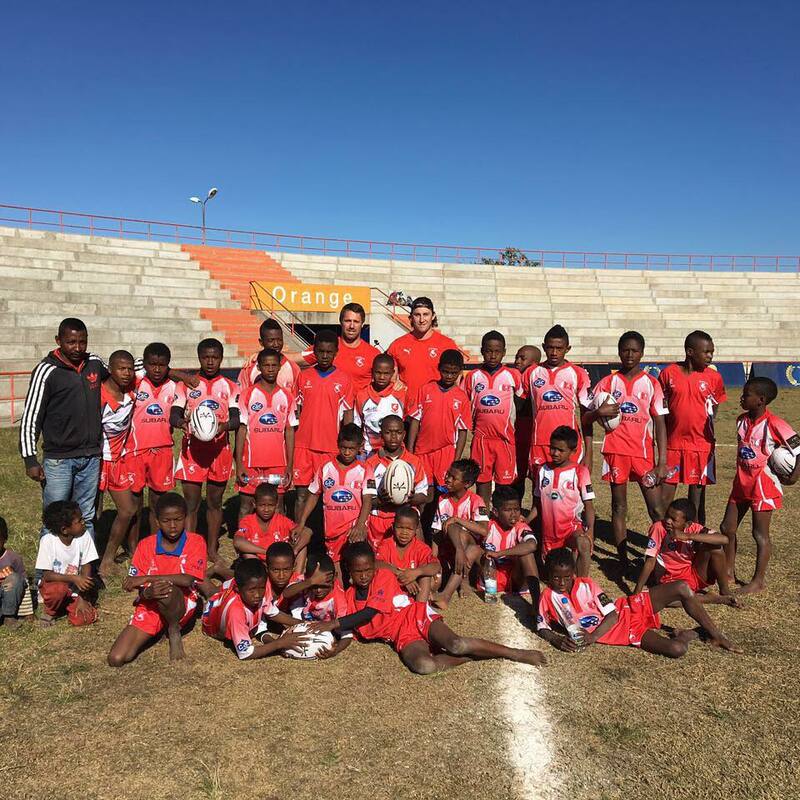 The Air Seychelles Mike Ballard Foundation Conquistadors and the Madagascan Makis, who are ranked No.41 in the world, will play an exhibition match at the Madagascan National Stadium on Sunday 3 July 2016, following a Junior 7s rugby curtain-raising tournament. 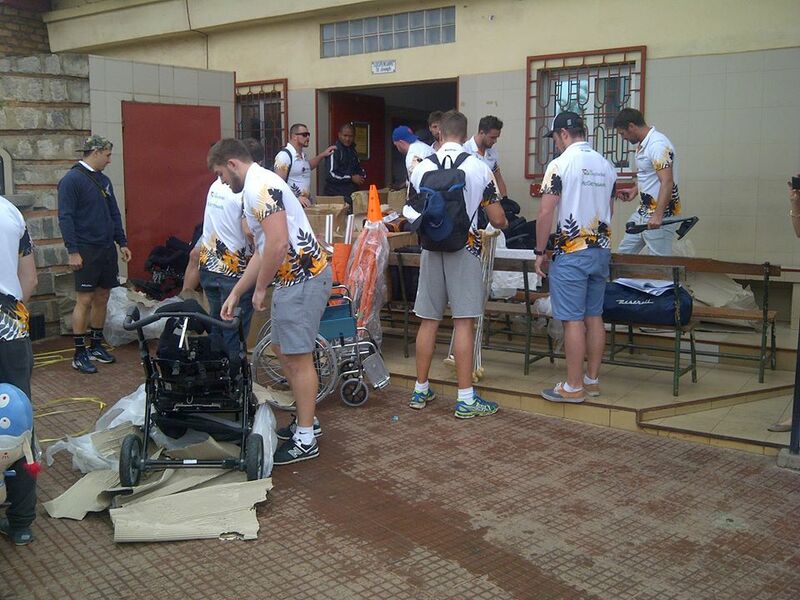 The mission includes donating wheelchairs to charities in the Seychelles and Madagascar, and also donating junior rugby clothing and boots and coaching junior rugby in Madagascar. Graham Murphy (UAE International, Abu Dhabi Harlequins). Tom Nolan (Qatar International, Doha RFC). Chris Jones Griffiths (UAE International, Abu Dhabi Harlequins). Harry Seward (Abu Dhabi Harlequins). Adam Telford (UAE International, Jebal Ali Dragons). Aaron Palmer (Qatar International, Manawatu NPC, Doha RFC). Brendan Rawlings (Exeter Chiefs, Dubai Hurricanes). 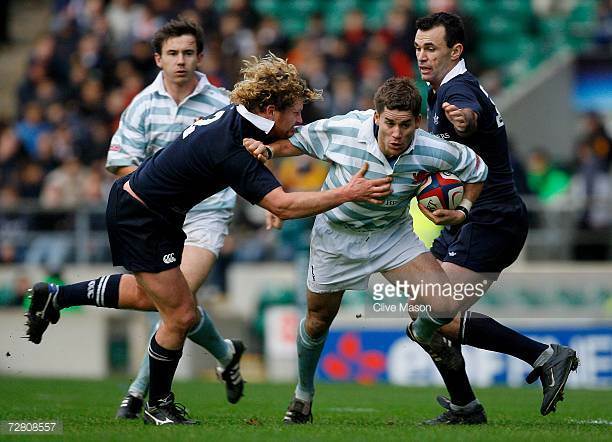 Winston Cowie (Oxford University Blue, Doha RFC). Wade Quinn (Qatar International, Bahrain RFC). Jamie Clarke (UAE International, Doha RFC). Ed Lewsey (UAE International, Exeter Chiefs, Abu Dhabi Harlequins). Luke Stevenson (Abu Dhabi Harlequins). Steve Hamilton (England Counties, Abu Dhabi Saracens). Mike Pugliese (Abu Dhabi Saracens). Tom Calnan (UAE Rugby and Rugby League International, Abu Dhabi Harlequins). Mike Ballard (Abu Dhabi Harlequins). Charles Etchells (Medic, Manchester University). The team consists of players from three of the Arabian Gulf countries – Bahrain, UAE, and Qatar. Players have been selected from eight of the Arabian Gulf Clubs – Abu Dhabi Harlequins, Abu Dhabi Saracens, Bahrain RFC, Doha RFC, Dubai Exiles, Dubai Hurricanes, Dubai Sharks, and Jebal Ali Dragons. Seven are from the Abu Dhabi Harlequins (Mike Ballard’s Club); five from Doha RFC; three each Bahrain RFC and the Dubai Hurricanes; two from Abu Dhabi Saracens, and one each from Dubai Exiles, Dubai Sharks, and Jebal Ali Dragons. The team boasts 9 internationals including the two most capped UAE players of all time – props Chris Jones-Griffiths and Graham Murphy. It consists of two former UAE Player of the Year nominees –Mike Ballard and Stephen Ferguson (who was voted the UAE Premiership player of the year for the championship winning Dubai Exiles in 2016); and two former Exeter Chiefs professional players – No.9 Ed Lewsey and rampaging loose forward, Brendan Rawlings. Eight squad members have captained their club sides – Aaron Palmer, Winston Cowie, Jamie Clarke (Doha RFC); Ed Lewsey (Abu Dhabi Harlequins); Adam Wallace and Sam Wilson (Bahrain RFC); Conor Coakley (Dubai Hurricanes); and Steve Hamilton (Abu Dhabi Saracens). The playing team includes four coaches – Winston Cowie (former Keble College (Oxford University), Abu Dhabi Harlequins Assistant and Conquistadors Coach); Ed Lewsey (Abu Dhabi Harlequins Assistant, British School of Al Khubairat and Conquistadors); Aaron Palmer (Doha RFC and Qatar National Team Coach); and Steve Hamilton (Abu Dhabi Saracens Coach). Both Palmer and Cowie, who played together at Doha between 2008 and 2012, have won the Arabian Gulf Premiership coaching clubs since – Cowie with the Abu Dhabi Harlequins in 2014 (unbeaten) and Palmer with Doha RFC in 2015, with Palmer also winning the West Asian Club Championship with Doha in 2012 and the inaugural Champion’s League this year. Palmer, a former Manawatu NPC player, is also the Qatar international side coach having won an impressive eight out of nine internationals with the side, including recently the West Asia Division III Championship. The Conquistadors have players with rugby pedigree across the park. The forward pack is gnarled with experience. Up front there is experience galore with over 50 tests for the UAE between Chris Jones-Griffiths and Graham Murphy; and the recently capped Tom Nolan (Doha RFC), who impressively debuted for Qatar with a meat pie; locks including the experienced Aaron Palmer (Manawatu NPC, Doha RFC and Qatar player / coach), Adam Telford (current UAE international hailing from the Jebal Ali Dragons); Conor Coakley (former Doha RFC and Dubai Hurricanes stalwart); and a powerful mix of loose forwards including former Exeter Chiefs pro and now fitness instructor with B2B, Brendan Rawlings, Jamie Clarke (current Doha RFC captain and former UAE international); Wade Quinn (North Queensland’s favourite son, an integral member of the Bahrain RFC pack); and Stephen Ferguson (the UAE premiership’s player of the season. Winston Cowie (Doha RFC top forward try scorer record holder (37 tries in 42 matches), moves back up to a hooking role where he played two Varsity Matches for Oxford University. The backline is also looking rather sharp, with the inside halve pairing from Abu Dhabi Harlequins, Ed Lewsey and Luke Stevenson; midfielders including the exceptional Stephen Hamilton (former England Counties and current Abu Dhabi Saracens coach) and the big and bludgeoning Adam Wallace (Bahrain RFC); and a back three that includes Bahrain stalwart, and former North Harbour age grade representative, Sam Wilson, Conquistadors top points scorer, Sean Carey; Tom Calnan (the eldest dual rugby and rugby league international); Sam Priest (Doha RFC, Oxford University and Canterbury age grade); former Bahrain RFC and now Dubai Sharks, Caleb Anderson, and the solid and sharp Mike Pugliese (Abu Dhabi Saracens). With an experienced group of players and coaches, the Air Seychelles Mike Ballard Foundation Conquistadors are already strategizing how best to play the Makis at their intimidating national stadium; how to face their haka; and all in front of a projected home crowd of 35,000 people. It will be fast, furious, and an exciting match. Rugby will be the winner. Of special note, Guinness Book of Records World Record Holder, Tom Calnan, the eldest dual international to debut in both rugby union and rugby league, will be coming out of retirement for the match. Group A: 3 teams: Tunisia (No. 40), Ivory Coast (No.51) & Botswana (No.63). Group B: 3 teams: Madagascar (No. 41), Senegal (No.49) & Zambia (No. 81). The winners of groups A and B will play the Cup final on 16th July. The winner of the Cup final will gain promotion to Division 1A, the Top 4 of African nations, for 2017. The objective of the Madagascar Makis is to win the Africa Cup, Division 1B, and be promoted to Division 1A. Being part of Division 1A will allow the Makis the opportunity to participate in the qualification tournament for the 2019 RWC in Japan. The match between the Madagascar Makis and the Air Seychelles Mike Ballard Foundation Conquistadors will be perfect preparation for the Makis as they attempt to win the African Cup, Division 1B. If you are a school or a club member and want to get involved, please contact the most relevant of our Air Seychelles Mike Ballard Foundation Conquistadors to you. 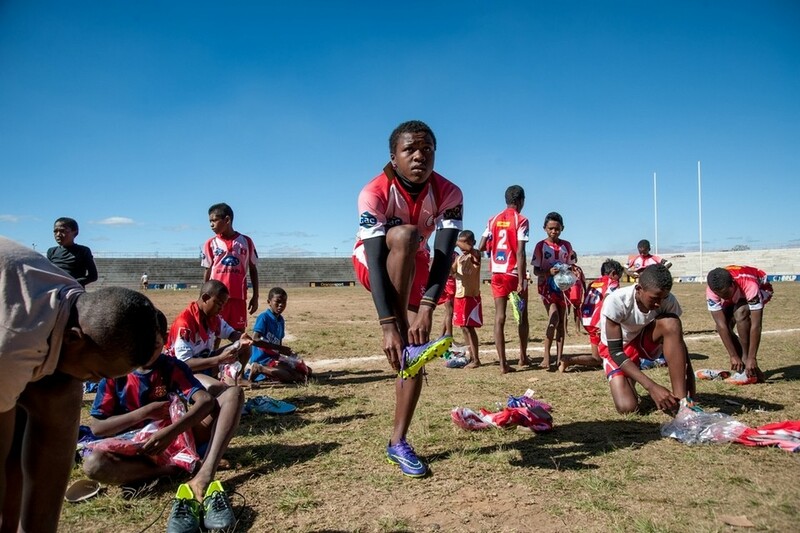 We would be grateful for your donated junior kit, or for seniors, any rugby kit and boots you no longer need – boots are in a shortage of supply in the Madagascan men’s senior matches. Every bit helps! We will keep you posted as the rugby gear comes in from clubs and schools. 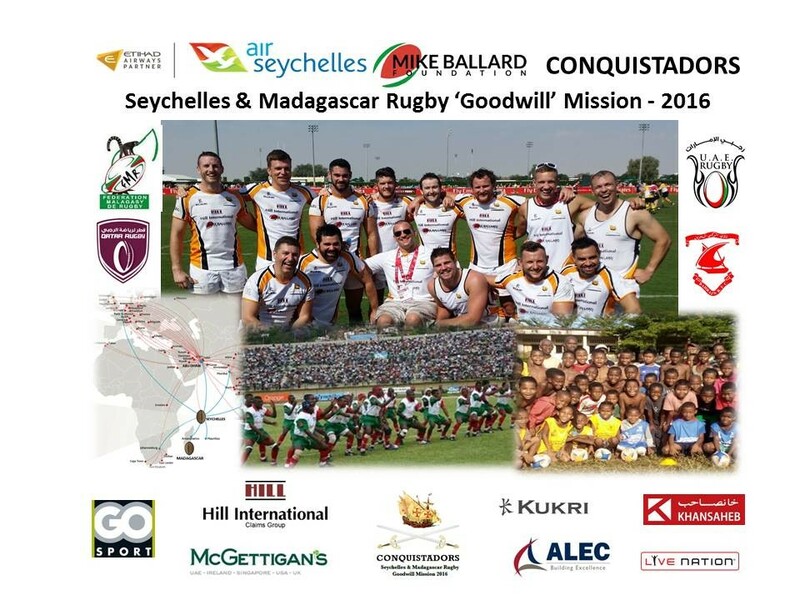 In June, the Air Seychelles Mike Ballard Foundation Conquistadors Rugby Team embark on a new adventure and goodwill mission…..to Seychelles and Madagascar. Set up meaningful relationships between rugby clubs and schools in the Arabian Gulf and Madagascar. 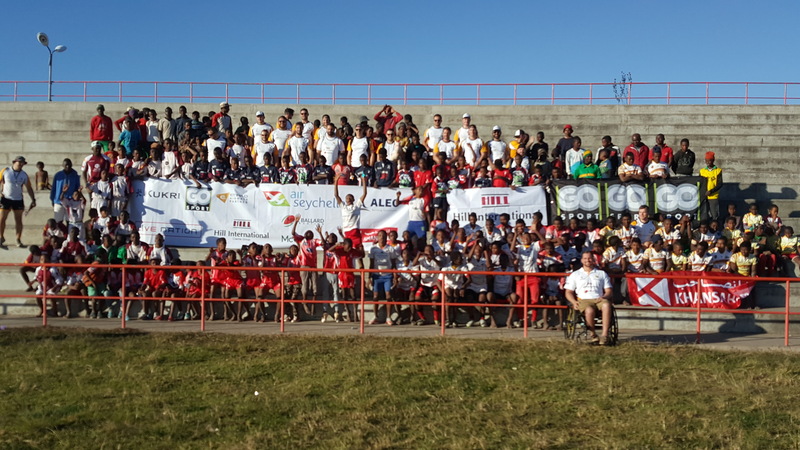 “My dear friends, I would like to extend my warmest thanks to all the members of the Air Seychelles Mike Ballard Foundation Conquistadors with regard to the sporting and charitable actions they will perform in Antananarivo so as to support the development of Rugby in Madagascar. We fully appreciate the opportunity to play the Air Seychelles Mike Ballard Foundation Conquistadors in the context of a friendly match. This game will provide our national team the XV Makis with a genuine preparation for the 2016 African Cup of Nations. It will be a great honour for us to welcome you in the purest tradition of the Malagasy hospitality and it will be our duty to make you discover some of the best sights of Madagascar. Marcel Rakotomalala, Chairman of MALAGASY RUGBY. The Air Seychelles Mike Ballard Foundation Conquistadors rugby team’s ethos is to have a positive impact on people through Rugby Union. Originally set up for the Dubai 7s in 2015 to support Mike Ballard, an American national and former UAE Rugby Player of the Year nominee, who suffered a serious spinal injury when playing in 2014, Mike and the team now wish to “help others” through an annual “goodwill” mission. Our team is made up of players from most rugby clubs in the Arabian Gulf region, including Abu Dhabi Harlequins, Abu Dhabi Saracens, Bahrain, Doha, Dubai Hurricanes, Dubai Exiles, Jebal Ali Dragons, and Muscat. The team’s manager, Mike Ballard, will be at the forefront of the Seychelles and Madagascar good will mission – Mike has courageously recently returned to Abu Dhabi to live and work, taking up a place at his old school, the “New England Centre for Children with Autism”, where his teaching greatly inspired the autistic children and their families. The team is coached by former Oxford Blue and Doha captain, Winston Cowie; and Ed Lewsey, current UAE international, former Exeter Chiefs professional and Director of Rugby at the British School of Al Khubairat. We are also well versed in sixteenth century Spanish and Portuguese discovery history – particularly in the Pacific and Australasian region. A learned bunch, the Conquistadors should be able to answer any queries you may have about the age of discovery – the opening of the maritime trade routes. Feel free to test us! Enroute to Madagascar, we are stopping over in Seychelles, and with the support of Air Seychelles, will be gifting a number of new wheelchairs to support Seychelles Hospital, in addition to donating rugby kit to the Seychelles Rugby Union. 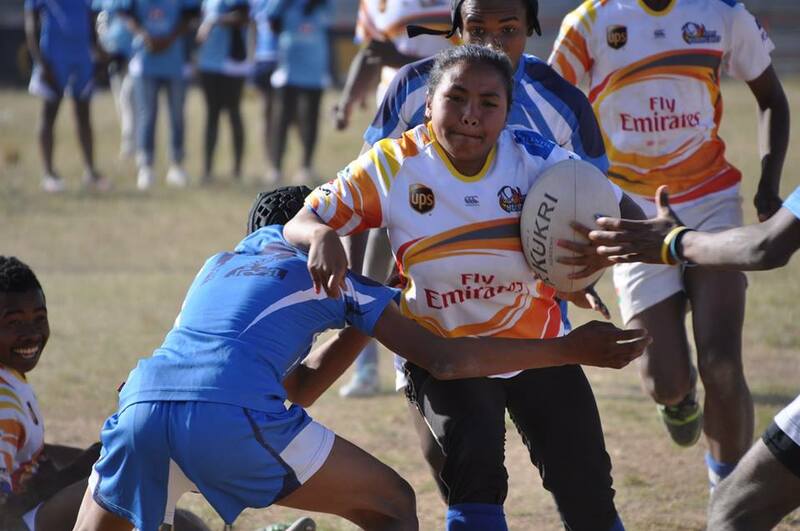 We have chosen Madagascar to tour because it is a country that is rugby mad (with the third highest number of registrations in Africa), and because the majority of rugby playing children (90%) don’t have access to rugby uniforms and gear. To give further context, Madagascar is a developing country where nine out of ten people live on less than two dollars a day. It is also a country in which rugby is the national sport with over 48,000 participants, and with a national team, the Makis, who are ranked 41st in the world. 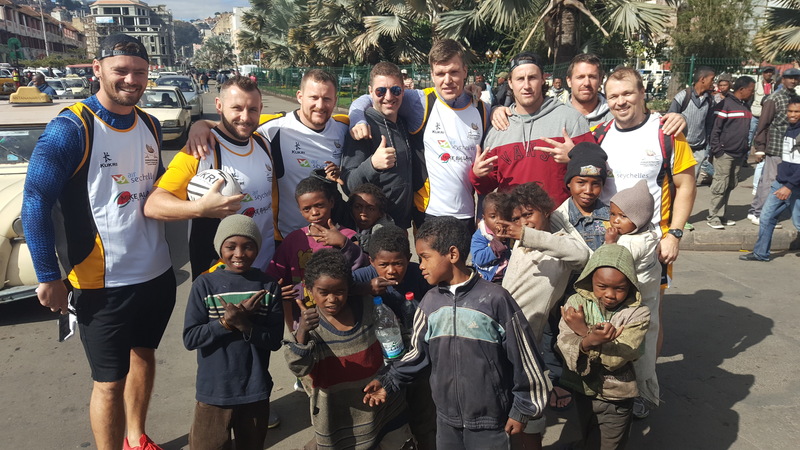 We want to do our best to not only distribute jerseys and wheelchairs, hold rugby coaching clinics and play a rugby match against the Makis; more importantly – we really want to establish meaningful relationships between clubs and schools in Madagascar and the Arabian Gulf region. Sponsors – Air Seychelles, Hill International, McGettigans, Kukri, Alec – Building Excellence, Live Nation Middle East, Khansaheb, and Go Sport! 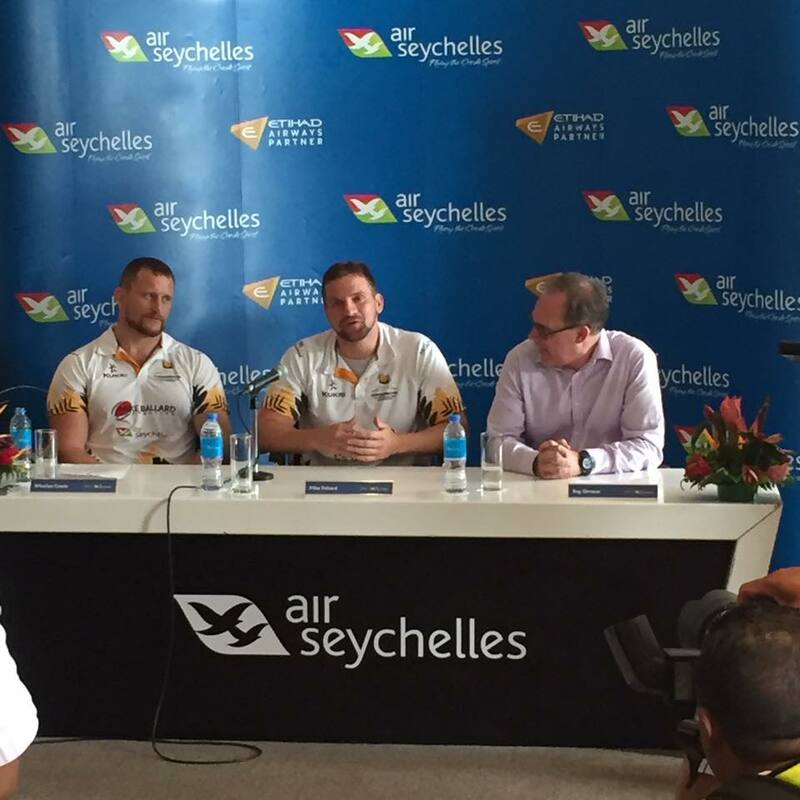 Primary sponsor: Air Seychelles – an Etihad Airways partner. And: Hill International Claims Group, McGettigans, Kukri Sports, Alec – Building Excellence, Live Nation Middle East, Khansaheb, and Go Sport. 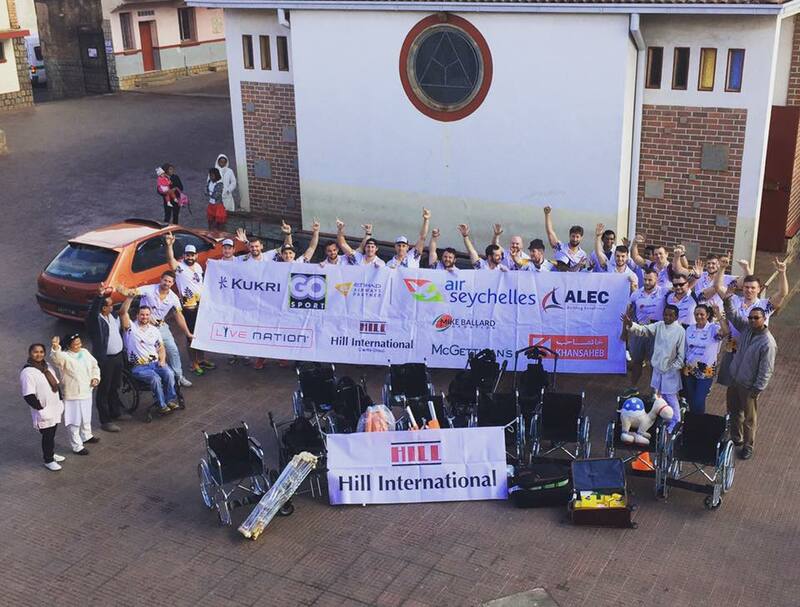 Thank you Air Seychelles, Hill International Claims Group, McGettigans, and Kukri Sports for all for making this wonderful initiative possible! More details on our fantastic sponsors are provided below. We need your help! We aim to gather at least one full set of second hand junior rugby kit from most of the rugby clubs and rugby playing schools in the Arabian Gulf – jerseys, shorts, socks, boots, and balls for between U8s and U14s. 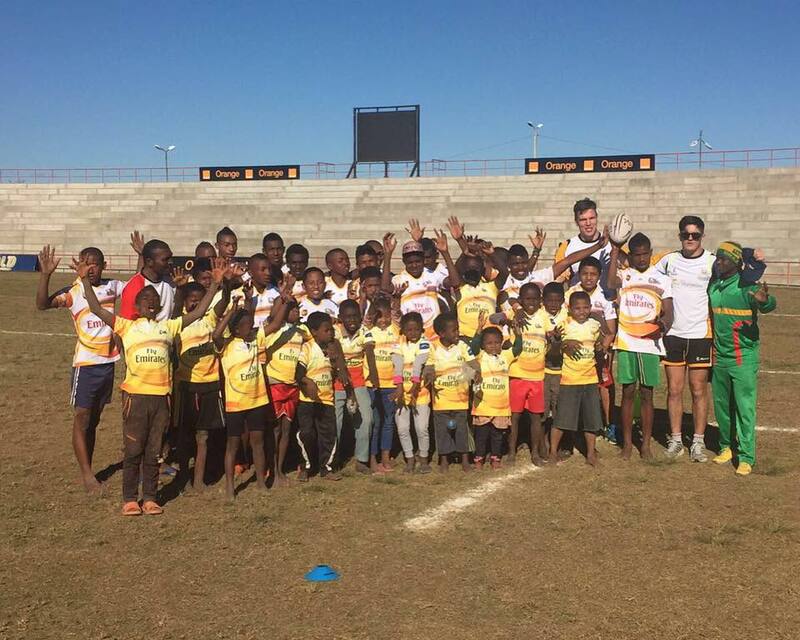 We would like to go to Madagascar with enough kit to gift two full sets (one U8 and one U14) to each rugby club and school we visit – with seven clubs and three schools currently in the programme. If you, your club or school has kit that could be donated, we would be grateful to hear from you. It all helps! 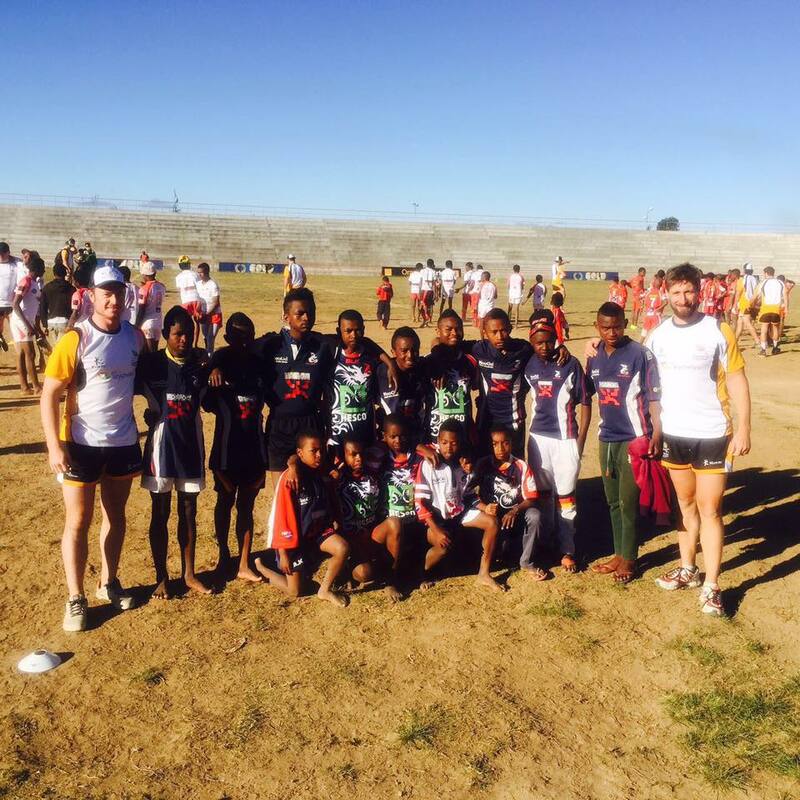 On the day of the ‘exhibition match’ there will be a curtain raiser 7s tournament held amongst the rugby clubs and schools that we have distributed the kit to – schools and clubs – we can put you in touch with your new brother club or school in Madagascar! As a global leader in construction consulting, with a portfolio of some of the world’s largest and most prestigious projects in every major sector of the construction industry, Hill International are committed to excellence, providing an unrivalled depth of resources, experience and services, including construction claims, project and cost management. With $500 billion in projects under management and experience on over 50,000 claims worth more than $100 billion, Hill are at the leading edge of international construction claims and project management, providing practical advice to contractors, employers, consultants, solicitors, banks and financial institutions. With over 4,800 professionals in 100 offices worldwide, Hill has the experience and the expertise to help their clients deliver their projects on time, and within budget, and with the highest quality possible. Our history is defined by thousands of successful projects. Our future is defined by the success of your next project. McGettigan’s Pub was first opened in Ireland in the 1960’s, on Queen Street in Dublin by Jim McGettigan. Since that day, the business has grown from Dublin, moved to Dubai and Abu Dhabi, back home to Donegal, Limerick and Galway with further locations in Singapore, Clarke Quay and New York City. 2010 saw the very first McGettigan’s Irish Pub open its doors in Dubai at Jumeirah Lakes Towers. Eighteen short months later, the McGettigan’s story in Dubai expanded with the opening of both McGettigan’s Irish Pubs at Dubai World Trade Centre and Dubai International Airport. McGettigan’s at the Al Raha Beach Hotel in Abu Dhabi has become an instant hit with local ex-pats and saw over 900 guests arriving to the launch night on May 2014. Dennis McGettigan spotted the demand for the pub in Abu Dhabi after speaking with guests in the Dubai pubs who told him that they happily make the journey from Abu Dhabi to Dubai by taxi, simply to have a pint. Unique décor, delicious Irish food & drinks, the best Irish and international entertainment and sporting events are the ingredients that have made McGettigan’s Irish Pubs such a success in the United Arab Emirates. Kukri are a specialist bespoke sportswear brand operating globally with an office in Dubai that looks after the Middle East region. We provide garments for up to 100 different sports and work with a number of the major schools and sports clubs in the region. The DNA of Kukri Sports dates back to 1979, when the British Army Gurkhas and RAF joined together to create a stronger rugby club, the Flying Kukris. Our mission from the outset was to give clubs a choice, an identity, and for them to be proud of their team colours. ALEC is the preferred contractor of choice for the execution of major, complex construction projects. The company started in the UAE in 1999, with a firm vision to raise the level of design and construction services and we currently operate in UAE, Oman and Qatar. ALEC has delivered developments of the highest quality to key clients many of which have become significant landmarks. The scope of ALEC’s projects includes: airport terminals, themed projects, hotels, retail developments, commercial buildings and residential. Live Nation is the largest live entertainment company in the world – now operating in over 40 countries and with a network of offices that far exceeds any competitor. Each year we produce over 22,000 events reaching an audience of over 200 million people. 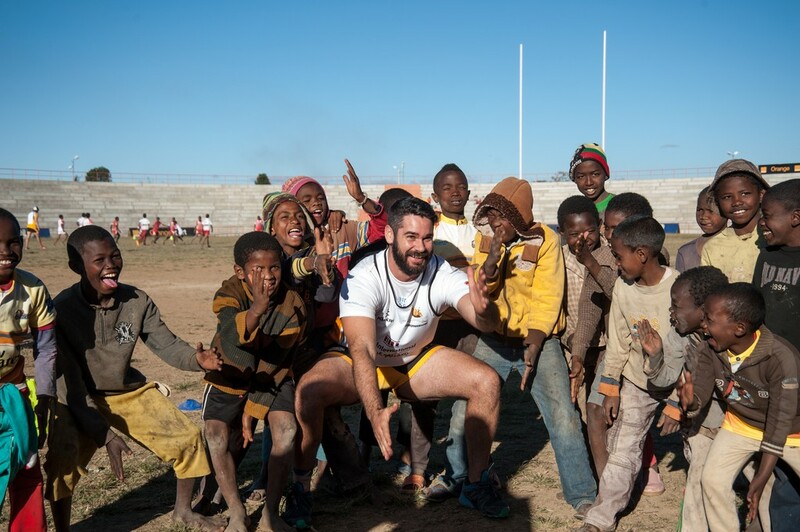 We are associated with superstars such as U2 and Madonna and now the soon to be infamous Conquistadors Select XV Rugby team working on the behalf of the Mike Ballard Foundation. Being an entertainment company we hope you play entertaining rugby on the pitch. 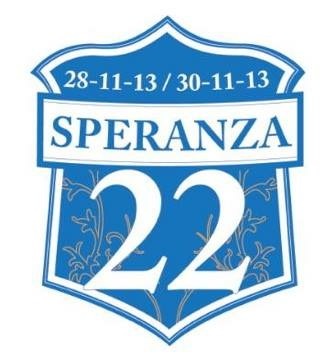 What a great cause……….. Best of luck in Madagascar. Khansaheb Civil Engineering L.L.C. was founded in 1935, making it the longest standing contractor in the United Arab Emirates. Since then Khansaheb has developed into the highly respected company that it is today – a company renowned for professionalism, integrity, high quality and reliable delivery, and ultimate customer satisfaction, with experience across all building and infrastructure sectors. In partnership with the UK’s Interserve since 1981, Khansaheb provides a combination of local knowledge and experience, management expertise and a professional service supported by international management systems and procedures. This partnership has enabled Khansaheb to become one of the leading construction and Facilities Management companies in the UAE, providing whole-life sustainable solutions for building and infrastructure projects from initial business case, through design, procurement and delivery into ongoing aftercare – creating, constructing and maintaining physical assets that underpin the fabric of society. Watch this space for more information on the Air Seychelles Mike Ballard Foundation Madagascar and Seychelles Rugby Goodwill Mission 2016. The ‘Goodwill Mission’ Squad will be named shortly. Rugby Union is a wonderful game. Over the weekend over 100,000 people attended the Dubai 7s, which has to be the model for other 7s tournaments around the world. In addition to the main event – 28 international teams competing in the opening event of the Dubai 7s world series – there were 245 invitational 7s teams and 24 netball teams competing on the eight pitches and courts that surround the main stadium and form part of the same complex. These teams included international invitational teams featuring superstars from around the world and local Arabian Gulf tournaments involving men and women from all over the Gulf, playing in open, club, social, veteran and U19 grades. The set-up is this: half the people are in good spirits and are enjoying themselves and having that ‘7s experience’ while the other half are equally in good spirits, playing or supporting – engrossed in their own competitive tournaments. It was in the Arabian Gulf Social Grade that the Mike Ballard Foundation Conquistadors found themselves, pitched against 20 other teams. And what a weekend was had. A bunch of blokes from all over the Gulf – a mix of largely UAE based former Oxford Blues, Abu Dhabi Harlequins, Doha, Bahrain, Dubai Hurricanes and Jebel Ali Dragons – banded together and formed a 7s team to raise money to support our mate, Mike Ballard, who suffered a serious spinal injury whilst playing rugby for the Abu Dhabi Harlequins in the West Asian Club Championship Final in 2014. Mike has made the courageous decision to return to Abu Dhabi to live and work, taking up a place at his old school, the “New England Centre for Children with Autism”, where his teaching greatly inspired the Autistic children and their families. And so it was that Mike arrived back in the UAE the night before the 7s, and was thrown straight into the action of the conquistadoring bunch. Mike Ballard and the Conquistadors. Check out Mike’s awesome video interview with SPORT360 by clicking here. Check out SPORT360s pre tournament article by clicking here and 7Days Sport supporting article by clicking here. The Conquistadors got off to a rocky start, losing the opening pool game 19-10 to a former winner, Barasti, and going down 14-0 in the second match after two minutes to the AFL mob, the very competitive Dubai Dingoes. Things seemed grim with two minutes down on the clock, and being behind, but then it all started happening for the Conquistadors. The boys launched the comeback of comebacks in the mid-day heat, eventually winning 29-19. This meant that in the last pool game, the next day, a big win was needed to have the required points differential to proceed. Lining up against the Pirates in the 5pm game on the Friday, the crowd was packed to the rafters, Nick Croker, Dave Kane, James Hamilton and the Doha veterans loudly supporting some of their former team mates. 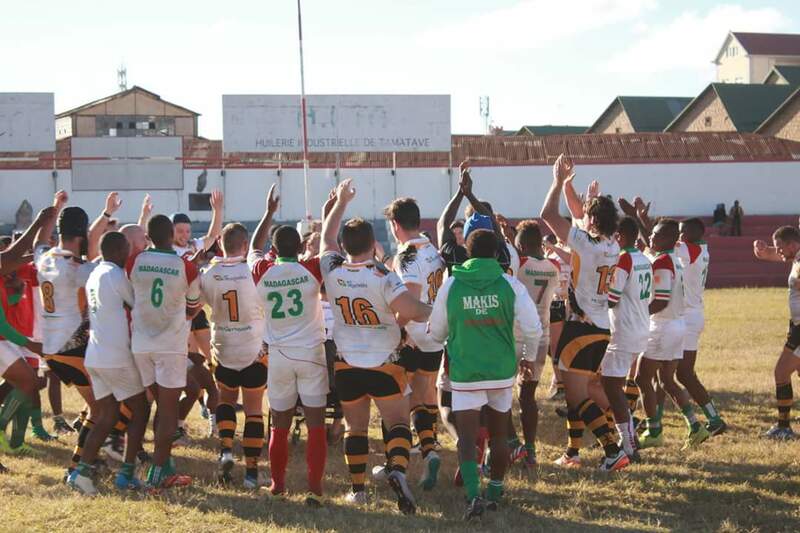 The boys played the near-perfect game – scoring 11 tries and winning 77-0. They marched on into the quarter finals. Two hours later, on Pitch 2, playing against the Dubai Hurricanes, the atmosphere was electric. 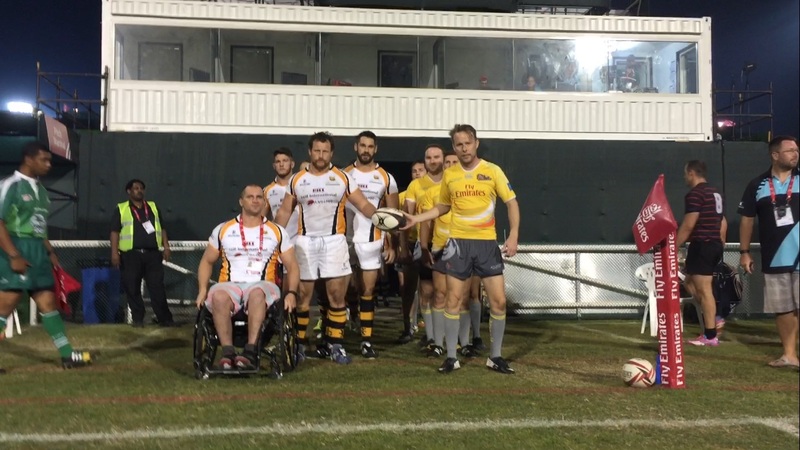 Mike Ballard Foundation Conquistadors v Dubai Hurricanes. Dubai 7s QF. 2015. The Conquistadors won the Quarter final comfortably, former Hurricanes stars Andrew Powell, Conor Coakley and Sean Carey enjoying the win against their former team mates. And then it was onto Day 3 – a semi final against the Emirates Flying Muppets. These guys were anything but Muppets, and while we pushed them, speed on the outside was too much, the Conquistadors finally going down to the eventual competition winners, three tries to one. It’s hard to explain, but it was just so phenomenally awesome to be involved in a competitive sports tournament like this – there were 260 teams there, that’s over 3000 people, all with a similar frame of mind – all after the same thing, which was, simply put, – playing rugby, for enjoyment and to win, and having a great deal of fun whilst doing so. Surely Dubai should be the model for other 7s tournaments around the world – the likes of New Zealand, Australia and South Africa. It adds a bit more of the grassroots ‘rugby ethos’ to the ‘7s,’ and is a bit more representative of what this wonderful game is about. And for a bunch of blokes from all over the Gulf, who came together to support Mike Ballard – old friendships were rekindled, new friendships were made, smiles were on the dials, new injuries picked up, and plans were made to get involved next year…to do something positive for Mike and charity projects further afield….and to chase that elusive Dubai 7s victory. Awareness was also raised of Iberian discovery theory – there are now at least 12 more rugby players (and friends) who can explain the incredible Portuguese and Spanish maritime exploits in the sixteenth century – which probably included the discovery of Australia and New Zealand by the Portuguese, and which may have also included a Spanish voyage to New Zealand pre Abel-Tasman. 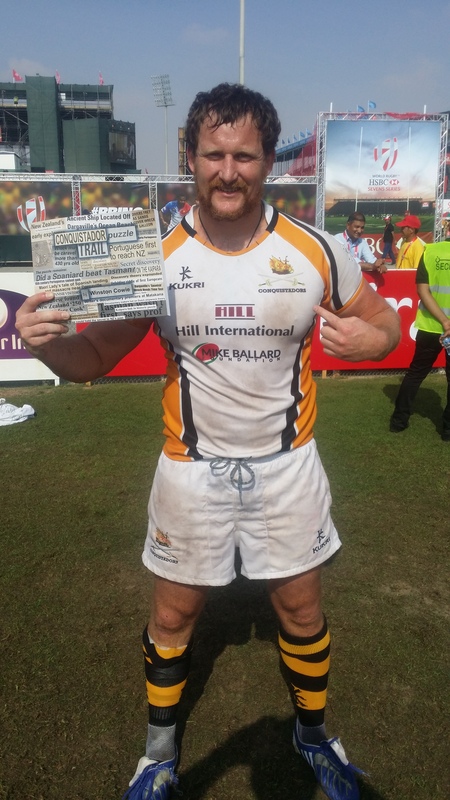 Author Winston Cowie playing for the Mike Ballard Foundation Conquistadors, Dubai 7s, 2015. Many thanks again to our very kind and generous sponsors: Hill International Claims Group; King & Wood Mallesons; Alec – Building Excellence; The One Group Middle East; The Picnic Basket and B2B Fitness for their superb support. • Graeme Murphy. Iberian Nickname: Hernan Cortes. Nationality: Irish. Teams: Abu Dhabi Harlequins. UAE Rugby international – second most capped player. • Phil Brady: Iberian Nickname: Afonso de Albuquerque. Nationality: Irish. Teams: Abu Dhabi Harlequins. UAE International. Manager of Abu Dhabi Harlequins A (2013). • Conor Coakley. Iberian Nickname: Vasco de Nunez Balboa. Nationality: Irish. Teams: Doha 1st XV. Dubai Hurricanes 1st XV. • Wade Quinn. Iberian Nickname: Wombat / De Quiros. Nationality: Australian. Teams: Doha 1st XV. Bahrain 1st XV. Qatar Rugby International. • Winston Cowie. Iberian Nickname: Vasco De Gama. Nationality: New Zealand. Teams: Oxford University. Maulers. Doha 1st XV. 37 tries. Second highest Doha try scorer ever. Top forward try scorer. • Brendan Rawlings. Iberian Nickname: Rapid / Andres de Urdaneta. Nationality: British. Teams: Exeter Chiefs. Dubai Hurricanes. • Edward Lewsey. Iberian-ish Nickname: Edward Teach. Nationality: Welsh. Teams: Exeter Chiefs. 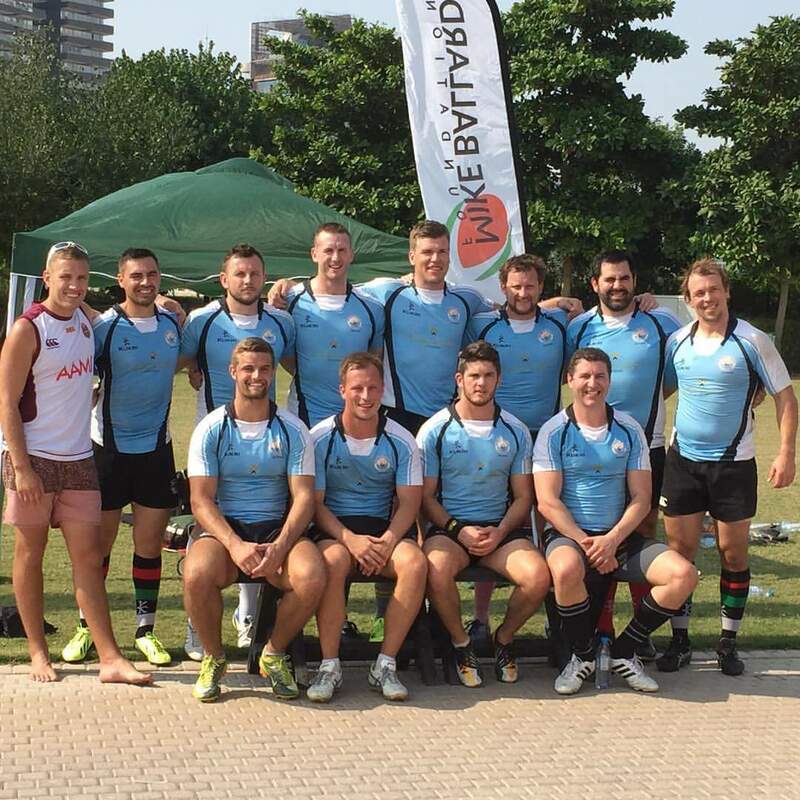 Abu Dhabi Harlequins. UAE Rugby International. • Tom Calnan. Iberian Nickname: Ferdinand Magellan. Nationality: English. Teams: Abu Dhabi Harlequins. Dual UAE international – rugby and rugby league – the eldest dual international of all time. Guiness Book of Record holder. • Sam Priest. Iberian Nickname: Juan Sebastian El cano. Nationality: New Zealand. Teams: College Rifles. Oxford University. • Joel Pikari. Iberian Nickname: Francisco Pizzaro. Nationality: New Zealand. Teams: Abu Dhabi Harlequins. Maulers. UAE Rugby International. • Andy Powell. Iberian Nickname: Hernando de Soto Nationality: New Zealand. Teams: Dubai Hurricanes. Nominated for Arabian Gulf player of the season. • Sean Carey. Iberian Nickname: Christavao Mendonca. Nationality: Irish. Teams: Dubai Hurricanes. Lansdown – National Irish Champs. Phil Cronin. Iberian Nickname: Christopher Columbus. Nationality: Irish Teams: Doha 1st XV. Jebel Ali Dragons. • Mike Ballard: Iberian Nickname: Henry the Navigator. Nationality: USA.Teams: Abu Dhabi Harlequins. Nominated for Arabian Gulf player of the season. Corporate / Commercial, IP & TMT / Dispute Resolution / Real Estate / Construction / Energy, Infrastructure & Projects / Tax. KWM offers a full range of legal services in the Middle East from our Dubai and Riyadh offices. For more information please email dubai@me.kwm.com or call +971 (0)4 328 9900. 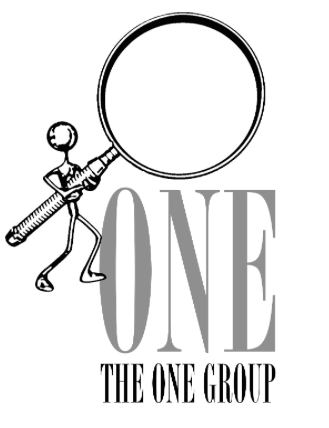 ONE Group is a boutique advisory company operating across the Middle East and Africa, with its head office being based in Dubai. We specialise in providing transparent advice and solutions to both Individual and corporate clients. Our advice is inclusive of insurance, investment, and strategic planning. 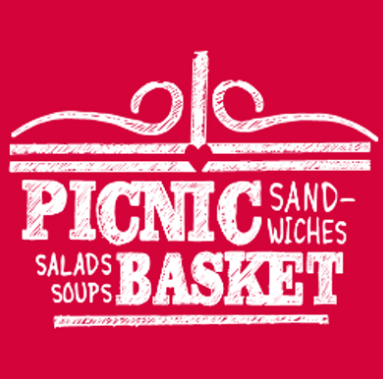 “Picnic Basket” is a wholesome UAE-founded catering company formed for busy Dubai residents who value delicious and homemade food. We are a ready-made food brand that takes the time customers don’t have to prepare scrumptious, wholesome food with the best ingredients. We run daily delivery services to more than 160 offices every day across Dubai, alongside scrumptious corporate and events catering. Founded in 2009 b2b (back 2 basics) has helped thousands of clients reach their goals. From individuals competing at professional level, post natal mothers looking to regain their bod from the glory days and recovering heart surgery patients. The recently formed Mike Ballard Foundation Conquistadors 7s rugby team have their telescope firmly set on the Dubai 7s. 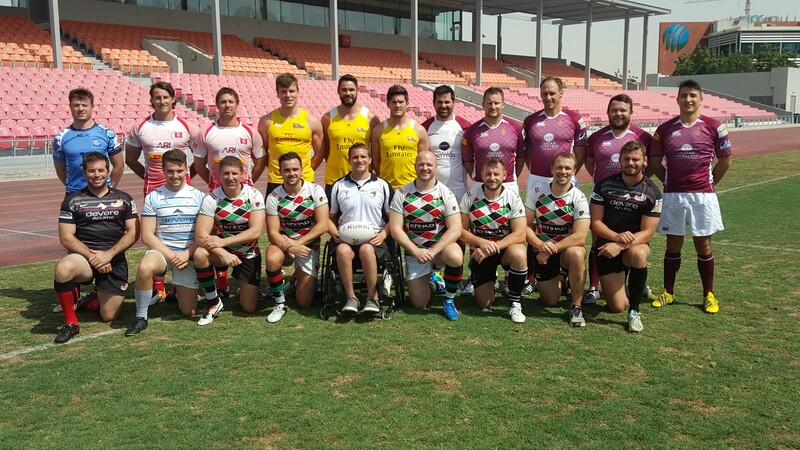 A mix of largely UAE based former Oxford Blues, Abu Dhabi Harlequins, Doha, Bahrain, Dubai Hurricanes and Jebel Ali Dragons have banded together and formed a 7s team to raise money for the Mike Ballard Foundation. Mike Ballard, a 29 year old American teacher working in Abu Dhabi suffered a severe spinal cord injury whilst playing Rugby for the Abu Dhabi Harlequins in the West Asian Club Championship Final in 2014. He has since had two serious operations on his spine to stabilise it, with his recovery hindered by an infection carried in the metalwork in his spine, which was recently replaced in April 2015. Since then, and over one and a half years since the accident, Mike has made excellent progress in his rehabilitation and has become increasingly mobile and independent, and has made the courageous call to return to Abu Dhabi to live and work, taking up a place at his old school, the “New England Centre for Children with Autism”, where his teaching greatly inspired the Autistic children and their families. “It’s a massive call from Mike to return to Abu Dhabi and “get on with life” after such a hard road, but its testament to his character that he has decided to do so. We are here to support Mike and initiatives like the Conquistadors really help Mike with some hefty ongoing medical costs,” says Mike Ballard Foundation co-founder Ed Lewsey. The team reads as a bit of an Arabian Gulf Rugby Barbarians team – the back line axis is that of the dominant Abu Dhabi Harlequins team of 2009-2010 – Ed Lewsey (former Exeter Chiefs and UAE representative); Joel Pikari (UAE representative) and the eldest rugby / rugby league dual international ever, Tom Calnan. Throw into the mix stars from the past few seasons: Andy Powell, Brendon Rawlins (also former Exeter Chiefs) and Sean Carey from the Dubai Hurricanes; Doha’s recent arrival, Sam Priest (Oxford Rugby Blue squad); coupled with a forward pack including the likes of the second most capped UAE player, Graeme Murphy; Winston Cowie (former Oxford Blue and 36 tries for Doha in 42 matches), second rows Conor Coakley (Doha and Dubai Hurricanes) and Phil Brady (Abu Dhabi Harlequins and UAE representative); and Wade Quinn (Doha, Qatar International and Bahrain) and you have a rather competitive team. Mike Ballard Foundation Conquistadors at the Eden Park 7s. 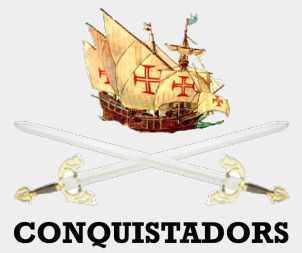 There is an added quirk to the Mike Ballard Foundation Conquistadors – the name ‘Conquistadors’ refers to a book that Cowie has authored, called ‘Conquistador Puzzle Trail,’ which assesses early Portuguese and Spanish voyages to Australia and New Zealand pre Tasman and Janzsoon. Many thanks again to sponsors Hill International Claims Group; King & Wood Mallesons; Alec – Building Excellence; The One Group Middle East; and The Picnic Basket for their superb support.